Project Perfect Mod :: View topic - Recruit for Openra Mod project. Recruit for Openra Mod project. Posted: Fri Apr 28, 2017 1:22 pm Post subject: Recruit for Openra Mod project. Subject description: CIV Beyond Earth inspire project. I'm looking for recruit who want to help me work on Openra total convertsion mod project. I do have some basic idea about this mod already but more idea still open. This is free project not for sale since I dont want to have problem relate to money. - Asset manager = know how prepare PNG image and convert into SHP , TMP use in the game this will include colour retouch on some area to make sure those asset will display in game correctly. - Map Designer = Know how to create game map using openra map editor. - Terrain aritst = Drawing terrain tileset for the game. [only draw and send to Asset manager for manage it] and it even better if you can use 3D programe for this job but if you know how to make TMP by your self please do it, It'll greatly sup the job from Asset manager. - Concept Artist = while I do have some idea about how artistic each factions should look like but it woud e better if some one can help me refine the idea at detail level which help me create those asset faster. - Environment artist = good at paint , 3d love working on prop asset like tree , ruins? you're very welcome. Some how I really like setting of Civlization Beyond Earth alot and I want to make it into RTS with some of my own idea. Humanity abandon earth looking for new home they come across to new earth like planet rich by nature they call "Eden" and start to colonize it they doing well at first but larger their sociaty become also their problem, humanity now seperate into several faction each of them try to shape the world suit for their image but whose ideal you will follow which faction you will fight for? While the game setting is very open but at first I want to focus with only 2 factions at moment (Human and Cyborg) and keep other factions only for just discussion at moment. Project discussion might open for everyone to join in (I hope this should be more fun and help team member feel more active than close envirionment) but development process will away work from behind scene. Truly I still not satify with it and might rework on them again if I can start this project. 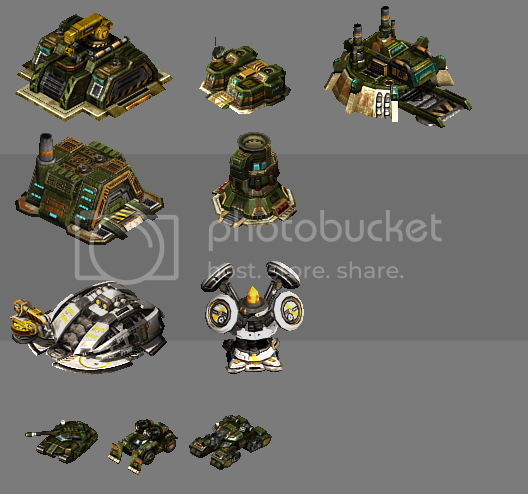 - I want to stick with Openra C&c formular but it will small scale micro focus RTS. - Each building can build unit seperately. - Unit graphic will be entirely SHP. - It might opposite to many people taste here but I want atmosphere in this mod look quite colourful not grey/brown atmosphere since the game setting on forest rich planet. sorry about my english. - -"
PM me if you interesting but keep in mind this project will not start until we get all position need since I can't effort to fill every position by myself even I like to. Ok now we got 4 people. I'm not that interested (not because it sounds bland but because I've already involved in too many OpenRA-derivate projects by now compared to the free time I have) but I'm okay with being a consultant/tutor if you ever get this project booted. I am on the same position as Graion, with my thesis, I barely have time to work on Nomad Galaxy these days, but I still think I could help somewhere, my modelling skills are OK, and I know a thing or two about modding ORA the fun way. Tho time wise, you would have to make it a long term project. Creator of Shattered Paradise and Nomad Galaxy. WARNING, there are tons of gifs on both pages. My answer is quite similar, I can do some support and help you to understand the yaml code - but our team/community has atm a break since several weeks from Crystallized Doom. Many are tiered of the work or busy with other projects/RL stuff. New to see you still modding around Holy_Master. Always loved your art work. While personally I wouldn't be able to help out, but perhaps some suggestions. See if you can set up a prototype of the mode with your art assets. in OpenRA and try their forums, outside of PPM. If not create even a mock up demo mod made in TS or RA2. Another place would be Mod DB. but people like their visuals. A few beauty shot screenshots show casing the mod would help your case and if you can get a fancy recording of some gameplay could entice some talent. I had try to make some simple mod with ORA by myself already but I found all I can do with it is add/replace exist units the game but no idea how to modify deeper function for this engine such as setup each factory able to build unit seperatly , reposition UI etc. and I also bad at map design. If no one help me I think I will scrap the project and try to do something smaller by my own. - Mapper = Make map for the game tileset will similar to Ra1 but might be little larger. - Additional 3D artist = more artist we have better looking the game will be. - 2D artist = make 2D thing such as Menu , UI truly I can do by my self but it help alot if some one can take care it for me. Posted: Wed Jun 28, 2017 5:11 pm Post subject: Re: Recruit for Openra Mod project. Really, really nice graphics. Beautiful. Work is much like a wife. It feed me. It f*ck me.